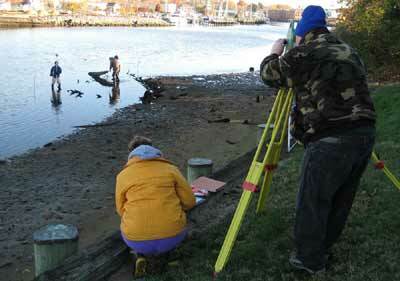 Late in November of 2007, MAHS volunteers returned to Salisbury, Maryland, to continue documenting the shipwreck remains exposed on the tidal flats of the Wicomico River. The work concentrated on the centerboard schooner lying out near the drop off to the shipping channel. Dr. Susan Langley, Maryland State Underwater Archaeologist, joined the MAHS team, bringing the Historical Trust's total station to help with mapping the wreck. It was a cold day, so we were all bundled up well, wearing many layers.